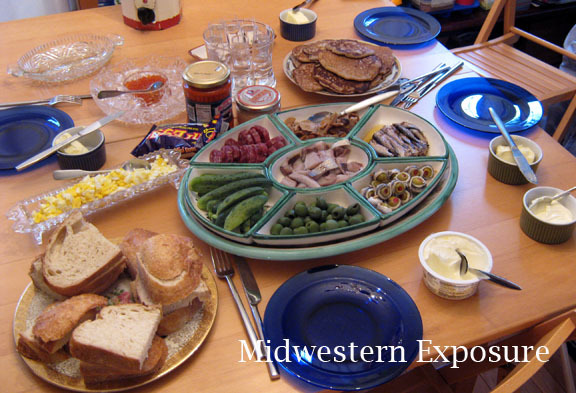 Midwestern Exposure | A New England Yankee's culinary adventures in the Heartland. I have a new favorite corner of Des Moines: the Shops on Roosevelt, on 42nd Street. My favorite Des Moines bakery, La Mie, was already there, and has recently scored a couple of new neighbors. The posh foodie boutique Vom Fass features specialty and infused oils, aged and infused balsamic vinegars, specialty liqueurs, and whiskey (i.e., all things “from the cask,” which is what “vom fass” means in German). As we perused the shelves of goodies, store clerks hovered nearby, ready to decant tiny tastes of oil and vinegar into disposable spoons. (Don’t worry — whiskey tastings are served in tiny, properly shaped glasses.) Underneath the casks, shelves upon shelves of glass bottles, some more decorative and some more practical in shape, were also for sale. You pay for the bottle the first time you fill it with something from one of the casks; on subsequent visits, you can bring back your empty bottle and have it refilled. 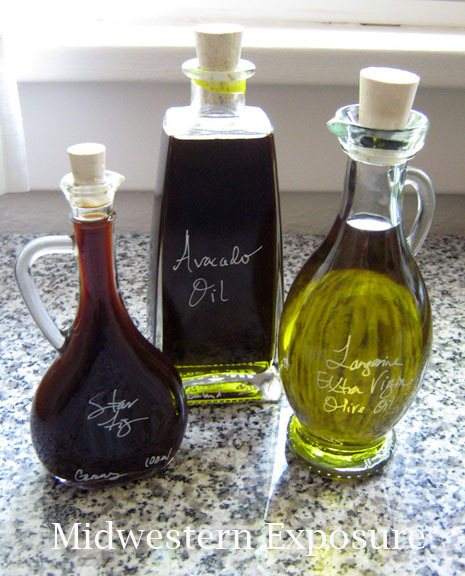 After much sampling, the Midwestern Gentleman and I settled on tangerine olive oil, star fig balsamic vinegar, and plain avocado oil. Like olive oil, avocado is a mono-unsaturated fat high in omega-3s, but the avocado oil has a much higher smoke point, making it a better choice for broiling, frying, and searing. The tangerine oil is bright and citrusy, as you would expect, but with a pleasant mellowness. It’s meant to be used as more of a finishing or dressing oil, as high heat will lessen the impact of the tangerine flavor. The star fig balsamic surges on the palate with a rich, fruity figginess. Yes, “figginess” is a word. (Taste this fig balsamic, and you’ll agree with me.) I also tasted a fig and chile balsamic that woke up my taste buds with a happy HELLO, but was a little too intense for the Gent. Maybe when we get back from our upcoming trip to Santa Fe, his palate will have grown more accustomed to chile heat [insert plotting, evil laughter]. As you can see in the above photo, I’m a sucker for decorative bottles. 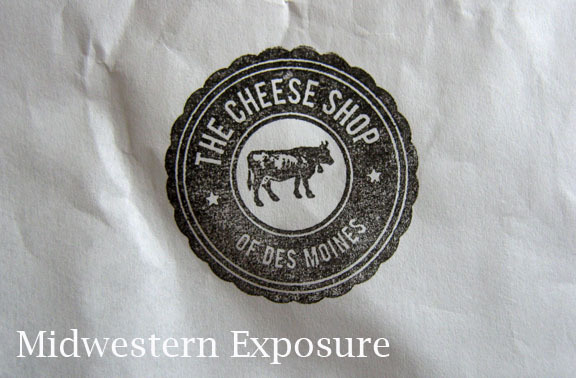 The other new tenant at the Shops on Roosevelt is The Cheese Shop. We just expected to pop in and purchase cheese to take home, but it turns out this tiny shop boasts a cozy, European vibe that makes you want to settle down on a stool at a high-top table, crack open a bottle of wine, and order a cheese plate — which is exactly what we did. Our party of five agreed on a bottle of Chateauneuf du Pape, a platter of three cheeses, artisanal crackers from Minnesota, and marinated olives. Periodically, as we noshed and chatted, one of us would slip off to the cheese counter for a taste of this and a nibble of that, all accompanied by the educational spiel of the knowledgeable staff. After tasting at least half a dozen cheeses, the Gent and I selected Avalanche “Midnight Blue,” a pristine ivory goat cheese from Colorado with distinct blue veins and a surprisingly creamy mouthfeel. 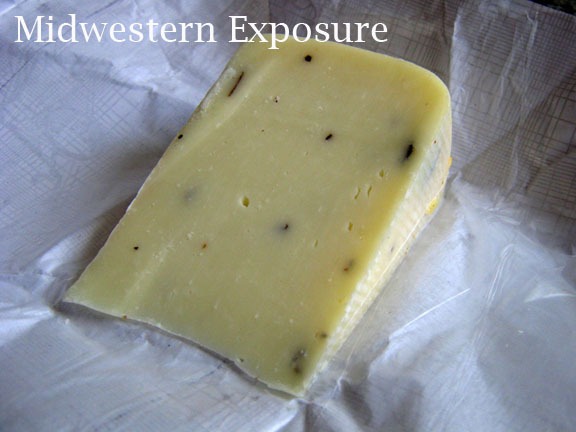 We added a Cacio Di Bosco, a decadent, truffle-flavored pecorino from Italy. 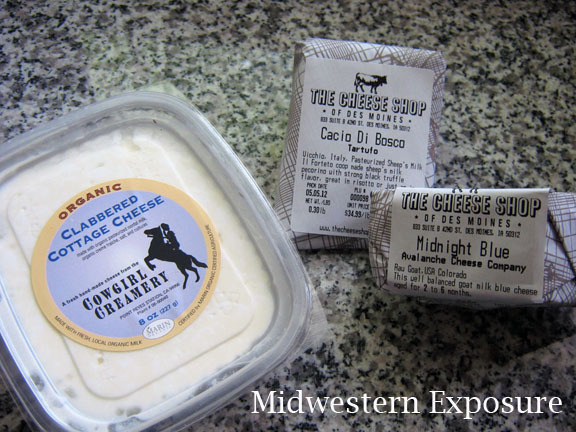 Finally, we rounded out our order with the highly-recommended Clabbered Cottage Cheese from Cowgirl Creamery; it’s pretty much the richest, creamiest cottage cheese I have ever tasted. 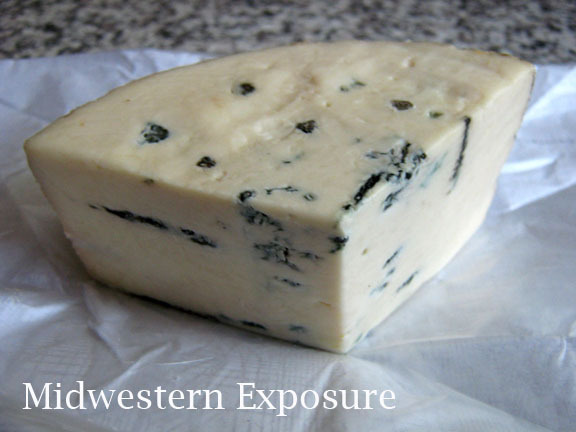 Avalanche “Midnight Blue” from The Cheese Shop, Des Moines. We tried drizzling a little bit of fig balsamic on a few, thin slices of Midnight Blue… and you can keep your sugary desserts: this is the way to finish off a meal. Cacio Di Bosco pecorino with truffle from The Cheese Shop, Des Moines. 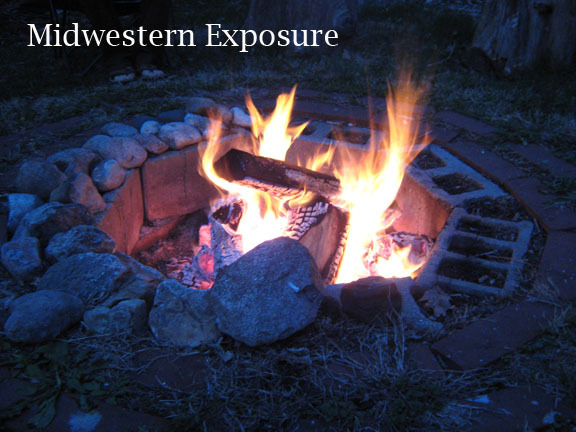 We are blessed with many friends who have fire pits in their backyards. 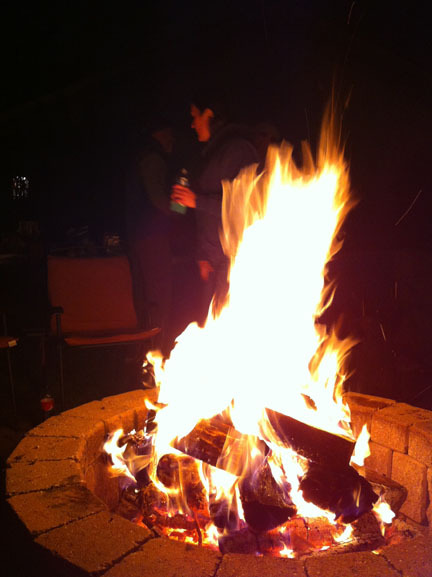 Already this spring, we’ve gleefully attended potluck dinners (usually ending in s’mores) around three such fire pits. 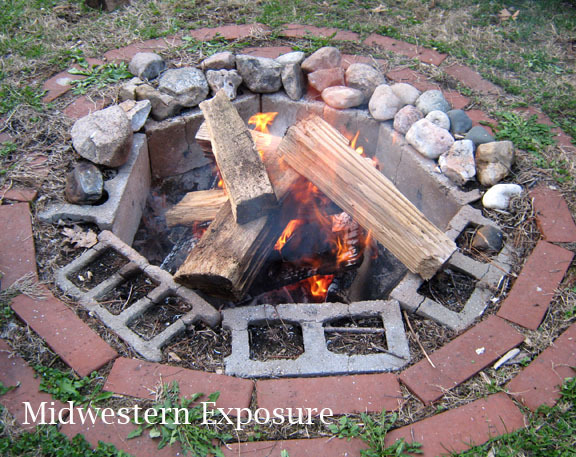 Stefan’s fire pit kicked off the season early, in March, followed by April gatherings at Kristin and Jason’s homestead and Kori’s beautifully landscaped backyard hideaway. I’m beginning to sense a pattern here, and it’s making me very happy. 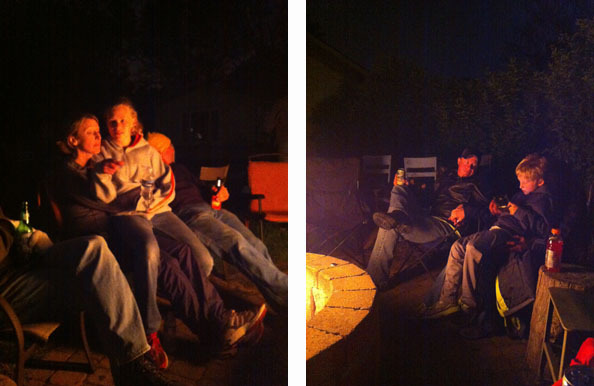 Imbibing, joking, and laughing around a fire with good folks and good food is my idea of a perfect Saturday evening. A gorgeously laid-out, banquet-style dinner at Kristin and Jason’s house mellowed into a campfire gathering outside later in the evening. 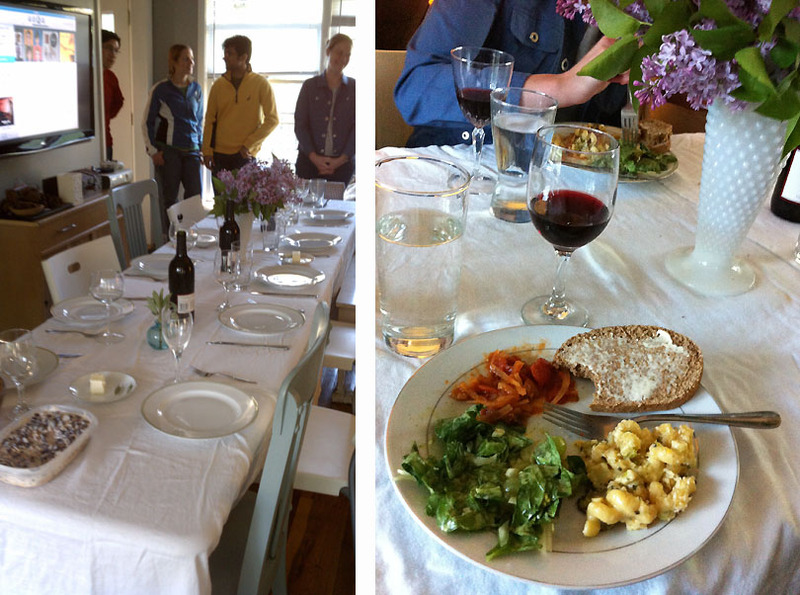 We dined on some delicious mac and cheese, a refreshing green salad with olives and shaved fennel bulb, and an addictive concoction of black beans and spiced yogurt, among other goodies. Dinner around the fire at Kori’s fed a casual crowd who arrived and departed with comfortable fluidity. 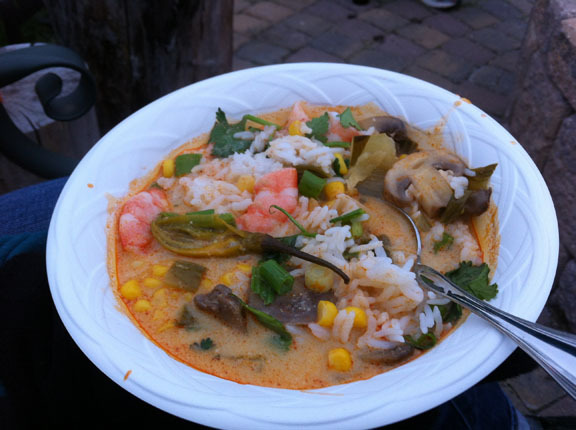 Kori had whipped up a huge batch of her famous Thai soup — a tangy, coconut-milk based soup with galangal, Thai chilis, mushrooms, sweet corn, shrimp, and cilantro. Ever considerate of her guests’ palates, she made one pot at full strength spiciness, and a second pot with less of a kick. 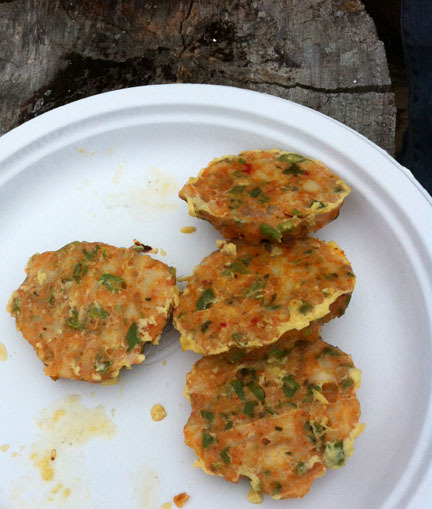 Kecia and Tim brought fish cakes so delicate in texture and so in-your-face flavorful I nearly swooned. I’ll be pestering them for the recipe soon, but at the time I was too engrossed in eating the cakes to remember the ingredients they listed. Something about red curry paste, tilapia, green beans, and… nom nom nom… the rest is a happy haze. 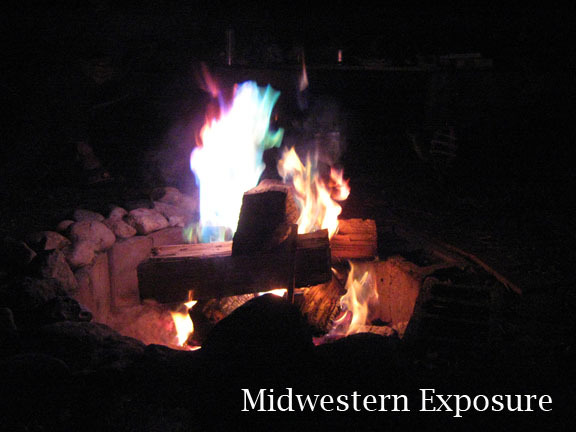 We’re all looking forward to many more cozy, food-filled evenings by a mesmerizing fire this summer! This versatile sauce is crazy-easy to make. It’s wonderful on Greek yogurt (or ice cream! 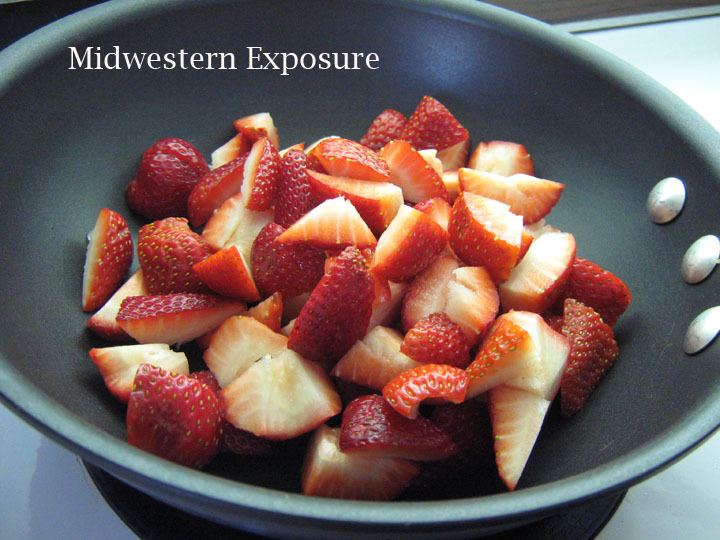 ), adds an unusual twist to strawberry shortcake, and can even be pureed and frozen like a sorbet. Our favorite way to enjoy it is warm and spooned over pancakes. Since this sauce uses only a few ingredients, make sure each is the best quality you can lay hands on. It’s particularly important to use a thick, syrupy, balsamic vinegar here. 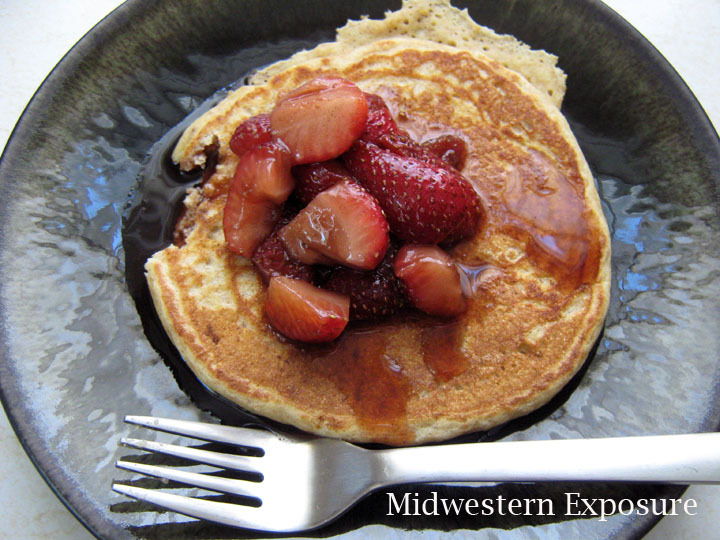 I like to use black currant-infused balsamic vinegar from Allspice, in Des Moines, and local Iowa honey. I also used fresh strawberries, but see no reason why you couldn’t try this with frozen. Keep it simple with just the three main ingredients, or spice it up with whatever extra flavors you like. For an extra kick, try it with a few pinches of freshly ground black pepper. 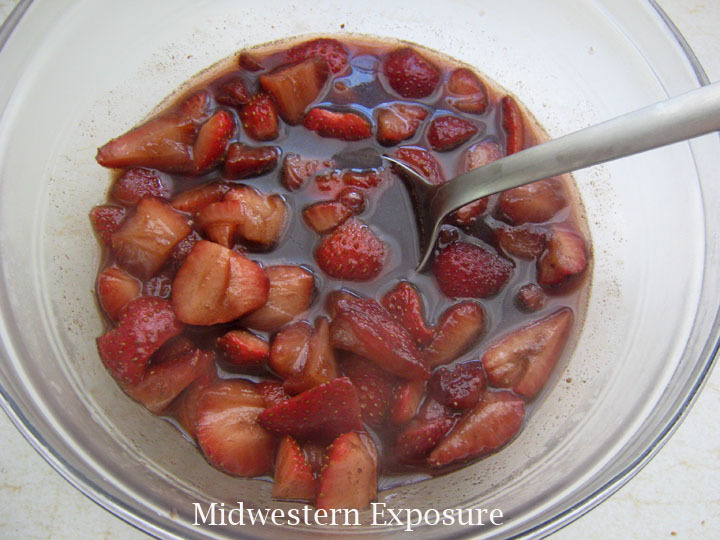 Heat the strawberries, honey, and spices (if using) in a small saucepan over medium heat. Cook for 5 minutes, stirring occasionally. Add the balsamic vinegar. Cook another few minutes, until strawberries are soft. Remove from heat and let cool for a few minutes before serving. Use as-is, or puree to desired consistency with a stick blender or regular blender. 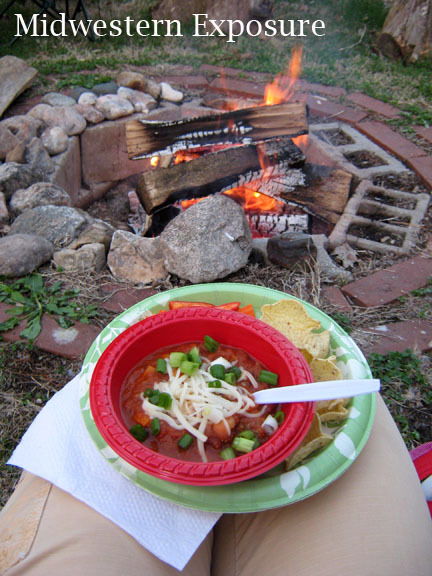 A firepit demands s’mores, of course, but as I learned a few weekends ago, a big bowl of chili next to the fire isn’t a bad idea, either. The Midwestern Gentleman and I joined a bunch of friends in Stefan and Jamile’s backyard and marveled that it was still March, and here we were without coats on, eating and lounging outside. Why is Mother Nature being so dang nice to us? I’m a little wary about what she might have up her sleeve for later this summer. In the meantime, however, I’ll continue to enjoy this warm, lush springtime. Stefan built this awesome firepit (above) in the backyard, but on this particular evening he handed over fire-tending duties to Tim. Tim has a variety of fire-building methods to suit any occasion (the chimney technique, the pyramid technique…) and is known for his ability to coax the flames to ominous heights. He kept things low-key this time, however, with an eye toward toasting s’mores later in the evening. Jamile was away for the weekend, but she still managed to play the gracious host from afar by leaving an enormous pot of vegetarian chili for us to enjoy. 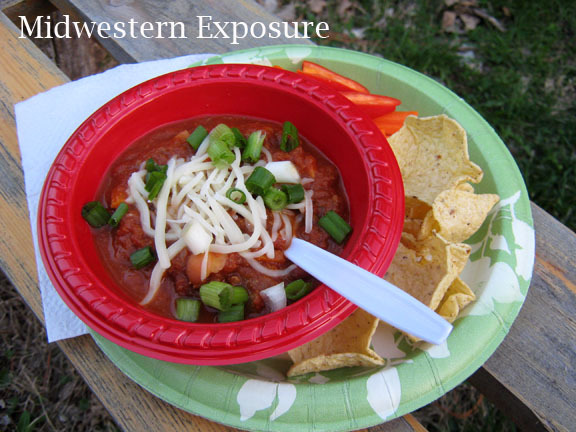 Kecia and Tim brought an omnivore chili, with bison meat, pumpkin, three kinds of beans, and chickpeas. Both were delicious topped with shredded cheese and chopped scallions. As the sun went down, we started to pass the s’mores fixings around. 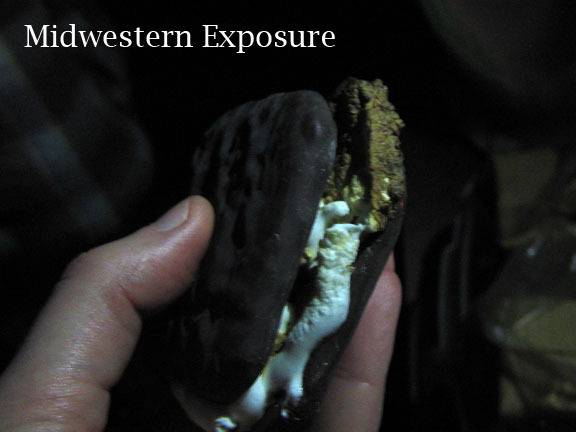 Corie and Robin brought Peeps and Reese’s peanut butter eggs for Easter-themed s’mores. I’m pretty sure Kori’s eyes lit up as much as mine did when she saw those Reese’s eggs; she is the one who introduced me to Reese’s peanut butter cup s’mores when we were camping on the North Shore last summer. The Gent and I brought our go-to s’mores crackers: fudge-dipped grahams. We also brought some new “stackable” marshmallows, which have a flat, pillowy shape (below). They worked fine, but I decided I prefer the way a traditional marshmallow puffs up, fat and gooey, and then oozes out the sides of the s’more. 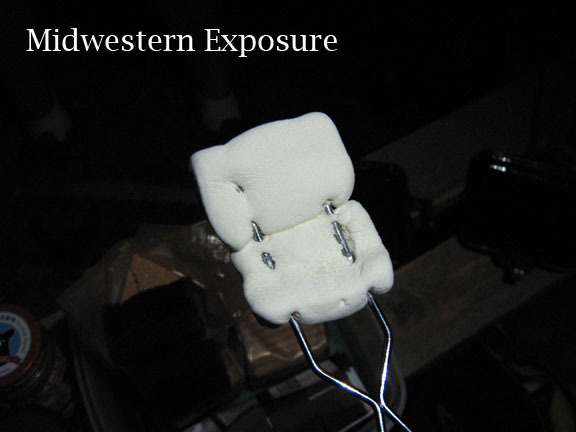 Flat-shaped "stackable" marshmallows, ready for toasting over the fire. S'more made with fudge-dipped grahams and two toasted marshmallows. Corie and Robin had brought a few firepit sandwich toasters, basically a hinged metal box on a long handle. Tim fixed himself a toasty peanut butter and jelly sandwich, which he then garnished with a s’more made in one of the sandwich toasters. 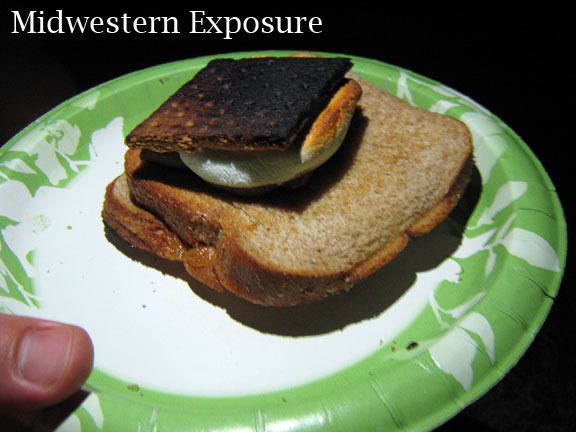 The graham cracker got a bit singed inside the toaster, but that didn’t deter Tim from enjoying his creation. Once our bellies were full, Corie busted out some fire sticks he had made from copper tubing. He propped them up at the base of the fire, and they turned the flames into a dancing kaleidoscope of greens, pinks, and blues. “S’more Night” was a fabulous way to say goodbye to winter. As Kecia later commented, “who says you can’t have fun outside in March in Iowa?” For once, Mother Nature played along! 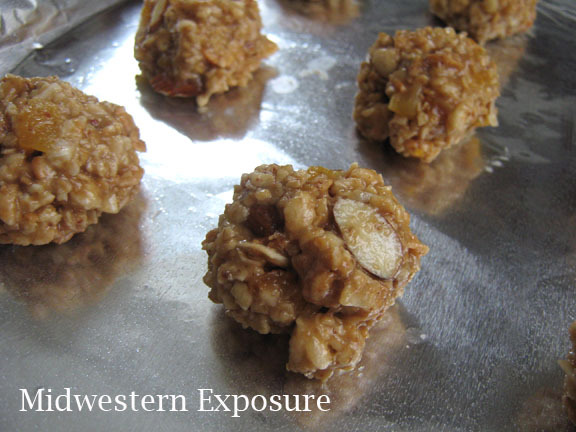 Since these bites are sweetened with honey, agave nectar, and dried fruit instead of refined sugar, they provide a gentler, steadier energy boost than more sugary treats. I used apricots, almonds and a granola from our local co-op that contains toasted coconut flakes, but you could just as easily substitute different dried fruits or nuts, or pick a granola that contains all of the flavors and add-ins you want — just make sure the fruit, granola, and nuts add up to about 3 1/4 cups total volume. Using smooth peanut butter makes a better binder in this recipe; the granola and nuts will provide plenty of crunch. If, like me, you’re not running a marathon any time soon, these bites are also a quick, nutritious breakfast or a satisfying afternoon snack. Preheat oven to 400F. 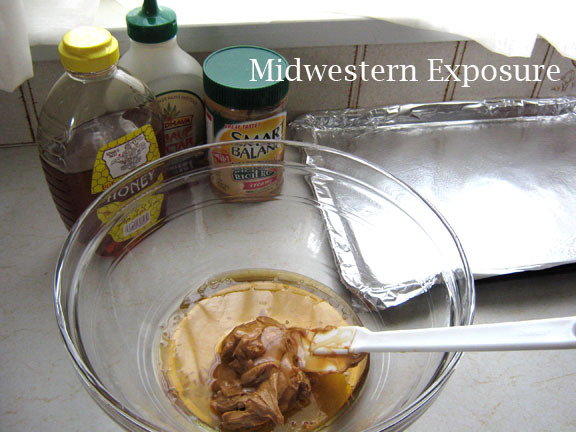 Line a large baking sheet with foil and lightly oil the foil. 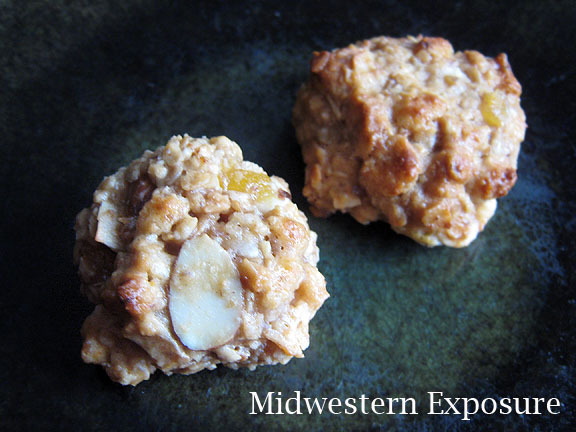 Coarsely chop the dried fruit (and nuts, if you prefer smaller pieces). Whisk together the wet ingredients into a smooth paste. Stir in the dry ingredients until evenly coated. Scoop up 1 1/2 tablespoons of the mixture at a time and, using clean, wet hands, mold into a ball. I can’t stress the wet hands thing enough. I know it sounds like a pain, but rinsing your hands in between shaping each ball so you are starting out with clean, wet hands every time will ensure that this sticky mixture holds together while you shape it, instead of sticking all over your hands instead. Place the balls a few inches apart on the prepared baking sheet, and bake for about 8-10 minutes, until just barely starting to brown on top. Remove from the oven and let cool completely on the baking sheet. Store in an airtight container in the refrigerator for up to 3 weeks (although I guarantee they won’t last that long!) I think these taste best cold from the fridge or at room temperature, rather than warm from the oven. Makes about 2 dozen. 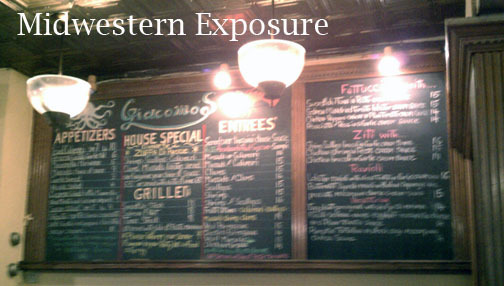 The Midwestern Gentleman and I have just returned from spring break in New England. It was a whirlwind tour of six states, five of which were in New England; we book-ended the trip by flying out of and into Minneapolis, Minnesota, where the Gent ran the 100% Irish For A Day 10-Miler to kick off our vacation. All of my vacations tend to be food-centric, but this trip was also filled with folks I love, which is the best combination of all. We started our New England tour with my Mom in Connecticut, where we had just enough time to dine at the Captain Daniel Packer Inne, which is fast becoming a spring break tradition. 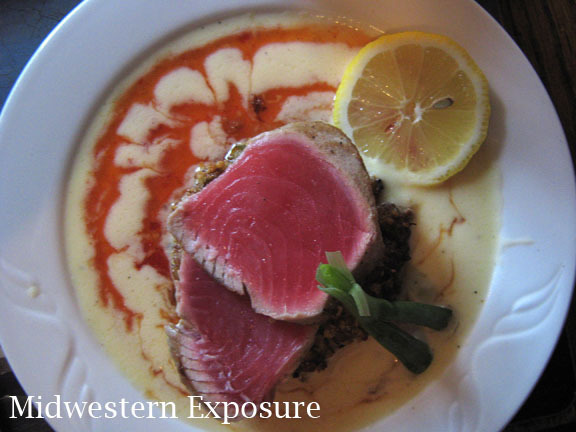 Every one of us ordered the ahi tuna over shrimp and crab cakes in a chili beurre blanc sauce. None of us regretted the choice. The next morning, we headed to Providence, RI, for Zakuski: The 2012 Edition with Cathy and Pete. I look forward to this annual event all year long. Cathy outdid herself with this year’s buckwheat blini, which we slathered with Plugra butter and creme fraiche. 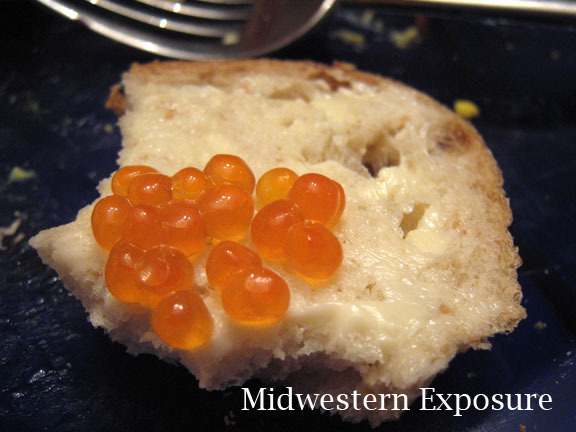 While the pickled herring and smoked Latvian sprats were as delicious as always, I found the salmon roe particularly irresistible this year. 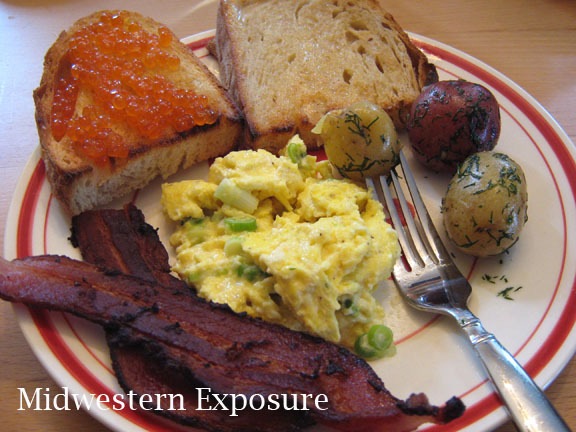 A generous dollop of salmon roe on a slice of buttered sourdough? Yes, please. 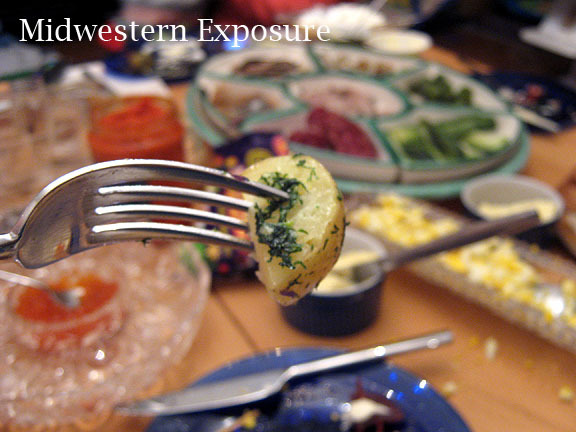 We also noshed on half-sour pickled cucumbers, green olives, pickled beets, pickled mushrooms, hard-boiled eggs, anchovy-wrapped olives, red pepper and eggplant spread, tvorog with sour cream, and creamy-tender baby potatoes generously seasoned with fresh dill. We washed it all down with three types of vodka: Ciroc, a French vodka made from frost grapes; Stolichnaya, our go-to Russian vodka, made from wheat and rye; and Hangar One’s chipotle-infused vodka, which paired surprisingly well with the Cadbury milk chocolate mini eggs to which both Cathy and the Gent are addicted. 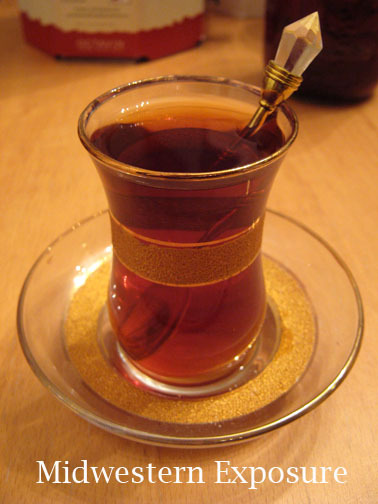 Finally, bellies full, we relaxed on the couch and sipped Russian tea from beautiful and delicate Iraqi glasses which Pete had brought back from an Army tour. In Brunswick, ME, Shannon and Joe took us to the Lion’s Pride, a local pub with 30+ beers on tap at all times. 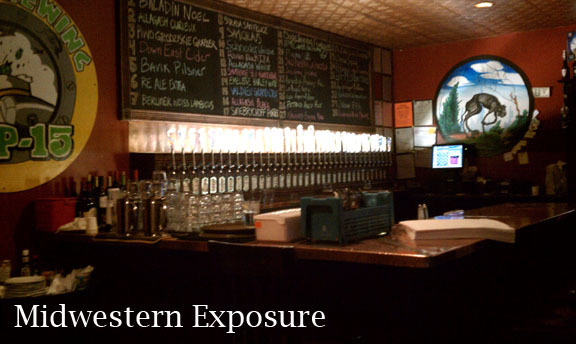 Luckily, the Lion’s Pride offers half-pours, so we were able to sample a broader array of brews. 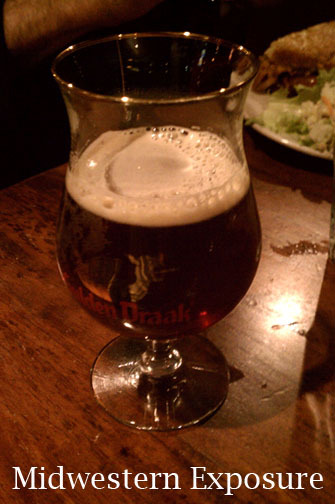 One of my favorites was the unusual Strada San Felice, an Italian ale brewed with chestnuts. 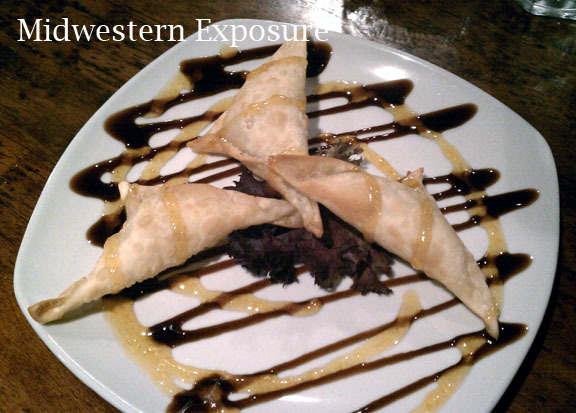 We shared a decadent appetizer of bites of brie cloaked in wonton wrappers and drizzled with two sauces (one was an apricot puree, and the other tasted like a balsamic glaze). 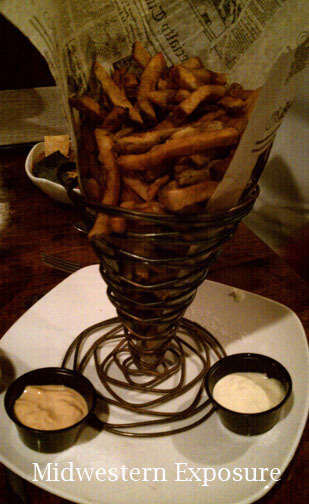 Considering the number of Belgian beers on the menu, it seemed only fitting to order Mussels and Frites. 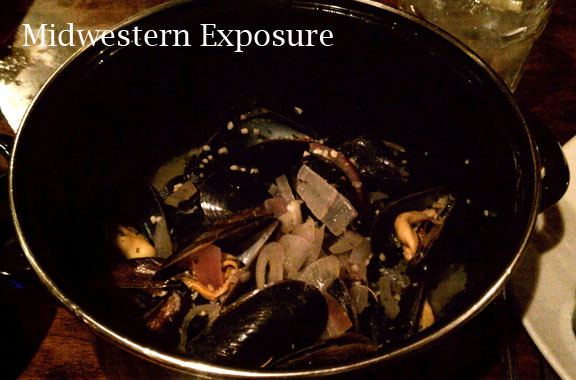 The tender, briney mussels were steamed in a white wine and shallot broth, while the frites came in a faux-newspaper cone, a health-code friendly update on tradition. 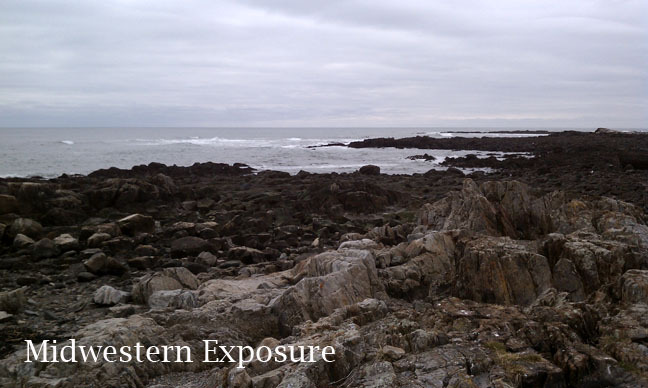 Although we didn’t eat in New Hampshire, we did stop to walk along the windy shoreline and take in the view. The Gent and I spent our last evening in New England in Boston, MA. 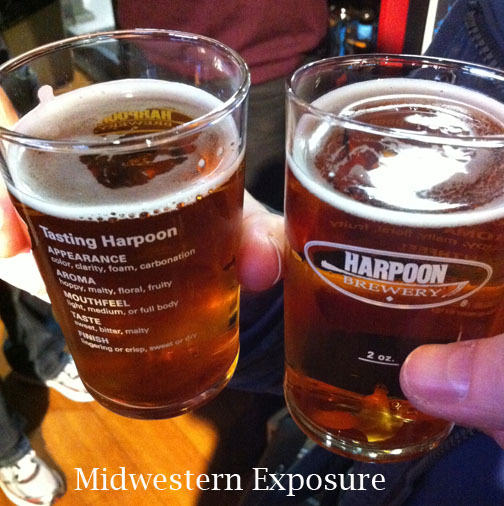 Harpoon Brewery has long been a favorite of mine, but unfortunately, the brewery doesn’t distribute to Iowa. 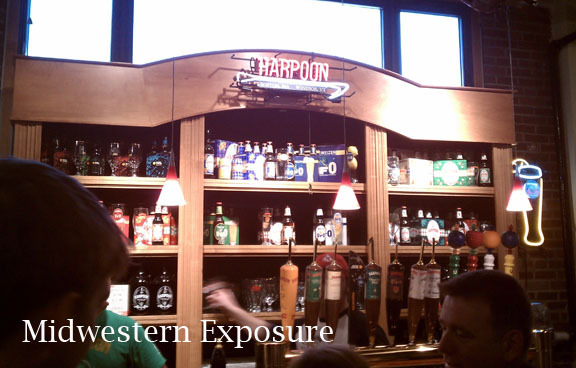 We sampled Harpoon’s fabled IPA, Catamount Maple Wheat (still brewed according to Catamount Brewery’s original recipe from before Harpoon bought them out), Munich Dark, Imperial IPA, and Chocolate Milk Stout. Harpoon uses real baker’s chocolate in this stout, and it was easily the smoothest, most chocolatey stout either of us has ever tasted, with a rich aroma more akin to a chocolate liqueur than a beer. 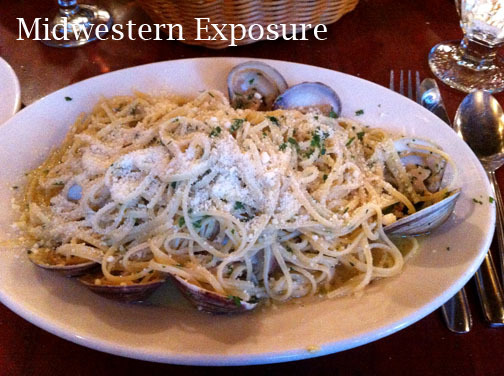 After our visit to Harpoon, we took Shannon’s advice and headed to the cozy and surprisingly affordable Giacomo’s Ristorante in the North End for some good Italian seafood. Even though we arrived early (around 5:30 pm) and it was drizzling, the line to get in was already halfway down the block. After a wait of about 25 minutes, I ordered linguini with clams in white sauce (a childhood favorite), while the Gent chose linguini with scallops in “Giacomo” sauce, a tomato-based lobster sauce blended with bechamel. Both were delicious, but the simplicity and intensity of my entree won the night. 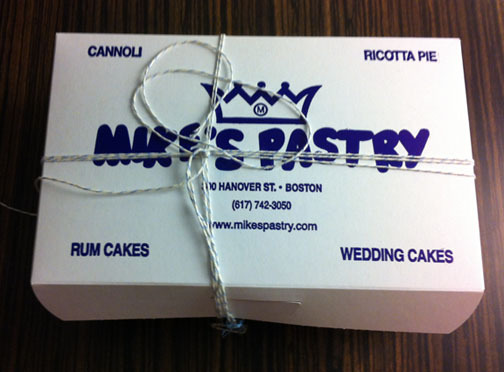 Since Giacomo’s North End location doesn’t serve dessert, we headed up the block to Mike’s Pastry, where you can buy a cannoli as big as your head in a dizzying array of flavor combinations. 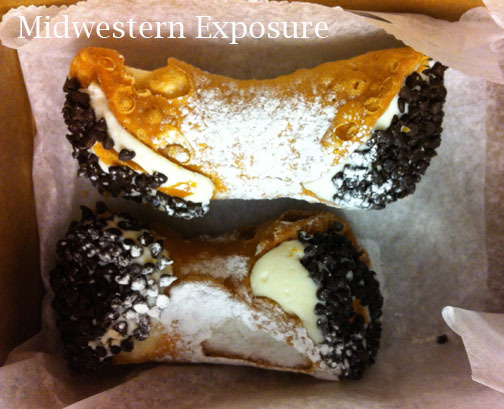 I’m a bit of a cannoli purist, so I stuck with tradition and ordered a sweetened ricotta cannoli dipped in chocolate chips at each end. It was perfection in and of itself, and also the perfect end to a delicious vacation.